The Enduring Visionary Leadership Community met earlier this week in Columbus, Ohio. 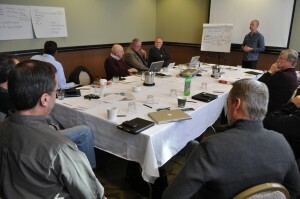 Visionary goals for the Fellowship of Grace Brethren Churches (FGBC) were on the agenda as members of the Enduring Visionary Leadership Community, the EVLC, met Monday and Tuesday in Columbus, Ohio. The group, a sample of pastors and leaders in the areas of church planting, leadership development, and integrated ministries, gathered to wrestle with goals, such as how to define a church and metrics for measuring success, while hearing updates from areas of ministry. At lunch, they broke into task forces focused on leadership and church planting to network, pray, and dream about the future of the FGBC. 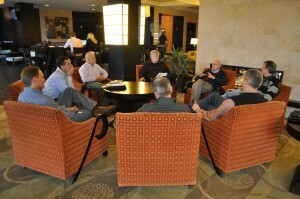 Tom Julien (back to fireplace) leads discussion in the leadership development team. The meetings were led by Bartley Sawatsky, the executive director of the FGBC and pastor of Grace Community Church, a Grace Brethren congregation in Mississauga, Ontario. He expressed cautious optimism for the future of the network of churches as he reviewed activities over the last few months. He is also meeting with leaders of larger churches in December and the executives of national and cooperating ministries in mid-January before the Fellowship Council meetings in late January in California.